Wastewater treatments or Septic tanks are often out of sight, and out of mind, until problems occur. Knowing the basics about your system and taking simple precautions can prevent problems. It’s a wise investment to keep your system working well. Replacing a field line can cost thousand of dollars. The Distribution Box, which disperses the liquid effluent over a large area of soil. The soil in the Drainfield, which absorbs the effluent and treats it by natural physical, chemical and biological processes. First, wastewater flows through a sewer pipe out of your house and into the septic tank, a box commonly made out of concrete. The tank must be watertight to keep sewage from leaking out and groundwater from seeping in. There are several modes of a typical septic system failure. The overwhelming failure mode or septic system problem is reduced or terminated effluent flow from the soil absorption component. The cause of failure can include and are not limited to: minimal or no maintenance of the system (pumping the septic tank), excessive hydraulic loading from the waste stream, excessive introduction of anti-biotic drugs, chemo treatments into the waste stream, food waste, kitchen grease, laundry lint. The fact is most standard septic tank system do not have adequate time for the relatively slow digestion process of the anaerobic bacteria to adequately perform their function. C.L. and Doris Tidwell started the business 45 years ago as a plumbing company. Quickly Mr. Tidwell realized that the “root” of most problems is the septic tank. 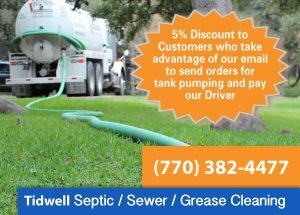 We now specialize in septic tank installations and repair. The business has grown to be a reputable part of Bartow County.